The last thing you want to worry about in your daily life is your smartphone's battery charge. 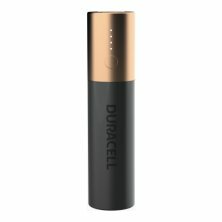 Duracell Rechargeable Powerbank 3350 mAh is your fast and portable solution to free yourself from the wall and keep your mobile devices going at all times. This compact, high capacity pocket charger gives you up to 24 hours extra of talk or surf time* and is compatible with Apple, Android and most USB-powered devices**. Thanks to the dual charge technology, it allows you to charge both the power bank and your device at the same time. Plus, it has LED indication to let you know how much energy in the best power bank is left. With Duracell’s 3-year guarantee and 10 safety features, you can go about your day with full power and no worries. Dual charge technology for simultaneous charge of the power bank and a phone or other USB-powered device. Up to 1.7 charges for iPhone 7 (hours of time and number of charges are estimated by comparing the iPhone 7 internal batteries specification on apple.com to the internal batteries of Duracell Powerbank. Results will vary by device and conditions. Duracell Powerbank 3350 mAh, Universal Portable Battery Charger for iPhone, Samsung and other USB-Powered Devices. Up to 24 hours extra of talk or surf time (hours of time and number of charges are estimated by comparing the iPhone® 7 internal batteries specification on apple.com to the internal batteries of Duracell Powerbank. Results will vary by device and conditions.